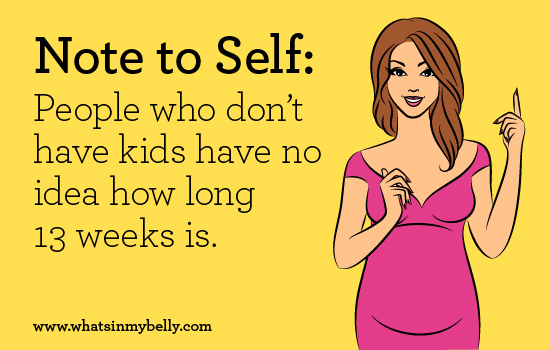 As I sit here with my giant belly, just six weeks away from my due date, I feel like I’m in a unique place. I’m starting to learn the parenting lingo, and I guess I’m technically a mother already, but I can also still relate to my childless friends. I know that motherhood is going to change me in many mostly wonderful ways, but I don’t want to completely lose sight of my old self either. If I were to run into the Old Mollee at the grocery store one day with the baby in tow, I’d want her to be proud of me. I promise to put on real clothes and at least a little makeup when I’m leaving the house. I’ll keep up with current events and pop culture so I can carry on adult conversations. I won’t give my child’s age in numbers of weeks or months that require people to do higher-level math. I know I’ll think my daughter is brilliant and hilarious, but other people will just think she drools a lot. I’ll be okay with that. I promise that not every single one of my social media updates will be about the baby. If she won’t stop screaming in a public place, I promise I’ll take her to the car. I realize that our stroller is almost as large as some smart cars. I’ll try to keep it out of the way. I know my child won’t be the first to ever get sick or injured or upset, and I’ll try not to act like she is. I’ll accept the advice and help of others graciously, but I’ll try not to give unwanted parenting advice myself. I won’t forget my friends, my pets, my personal interests and most importantly, my husband. I’ll laugh at myself along with all the other mothers when I break every single one of these promises at least once. And I promise to try harder next time. Mollee and her husband, Matt, live in Midlothian, Virginia, and are eagerly awaiting the arrival of their first baby (a girl!) in May 2013. (Check out her baby guessing game here.) Although she helps pay the bills by doing graphic design, Mollee’s true passion is for making things with her hands. Find more of her recipes, paintings and crafts at molleemade.com.